To what extent has the EU ETS driven GHG abatement in the short and long term? The EU ETS has been subject to increasing levels of scrutiny as the policy instrument has been widely acknowledged to have underperformed in recent times (reflected by the weak price signal) as a consequence of external shocks (i.e. economic recession) and policy design limitations (i.e. lack of flexibility in the supply of permits). Although the Conclusions of the European Council reaffirmed in October 2014 that the EU ETS would remain the main instrument for GHG abatement, reform will be necessary to ensure that the EU ETS functions correctly in the future and delivers a GHG reduction of 43% below 2005 levels as outlined in the 2030 Framework. As the scheme enters a critical phase in its development, we have been commissioned by the EEA to perform a review of evaluations on the EU ETS and to identify gaps that could be addressed in future research.The results of this study can contribute to learning from previous experiences with the EU ETS in view of seizing the EU ETS’ potential to make an important contribution to achieve the 2030 GHG reduction target confirmed by the European Council. The evaluation of the performance of the EU ETS needs to be improved upon, in particular in order to identify and better address areas where the functioning of the EU ETS could be improved. Evaluations reviewed after screening process by methodology. Several evaluations may have adopted more than one methodology. Source: own illustration. Important methodological gaps exist in the construction of credible baselines from which to assess the impact of the EU ETS on GHG abatement, competitiveness etc. It therefore should be a priority to encourage greater collaboration amongst researchers to ensure that these counterfactual baselines become more standardised and widely agreed upon in the future to enhance the comparability between evaluations. Data gaps identified in the literature will need to be addressed if important questions concerning the performance of the EU ETS, especially with regards to investment leakage, are to be definitively answered in the future. 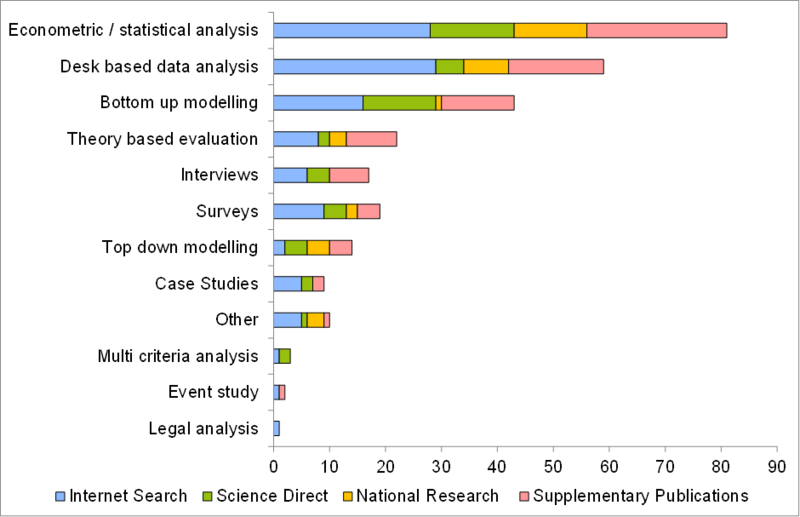 Coverage gaps in the literature mainly relate to the emergence of new topics as the EU ETS enters a period of reform. It is evident that further clarity will be required to ascertain whether additional complementary policies (i.e. emission performance standards) are necessary to improve the dynamic efficiency of the scheme and create a strong and stable price signal to promote the low-carbon technologies necessary to deliver the most ambitious emission reductions targeted in 2050.